The snow field sloped upwards ahead of us, the size of a five-a-side football pitch. When we reached its edge, four stones, protruding from the middle of it, stood up and loped away: mountain hares, that had been sitting stone-still in bowls they’d scraped in the snow, to cool down in. 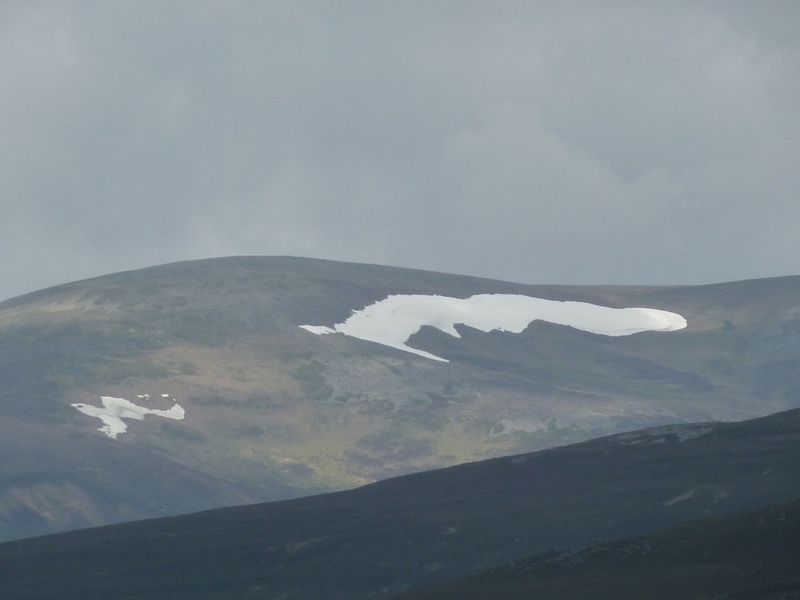 It was late June in the Cairngorms and nearly 30 degrees, but Ear-choire Sneachdach, ‘the snowy east corrie’ on the flank of Beinn a’ Bhuird, still held significant patches of snow. We kicked steps up to the bowls, finding in the centre of each a cluster of droppings, small fibrous pellets, like offerings. My youngest daughter and I were climbing her first Munro. The glare of the sun on the snow stung our eyes. We kicked our way off onto a ridge that would take us to the top and stopped to rest by an outcrop of granite, leaning in to its shade and gulping water from our bottles. Up until the early twentieth century, the snow in Ear-choire Sneachdach would often remain year round. It’s still known locally as ‘the Laird’s Tablecloth’, and according to legend, the Farquharsons, owners of the nearby Invercauld estate, will hold their land as long as the Laird’s Tablecloth is spread on Beinn a’ Bhuird, ‘the hill of the table’. On the final section of ridge, the stones beneath our feet radiated back the heat of the day. Our pace slowed. It was strange to feel the sun so intense – in Scotland. Nearing the summit, my daughter acknowledged that she’d suffered on the steep bit, but that she never thought of turning back. I was glad we’d waited until she was fifteen: too young, and the day might have been torturous, putting her off mountains for life. The south summit of Beinn a’ Bhuird sits at just under 4000ft. It’s marked by a simple cairn on a plateau that stretches over a mile to the north summit. We took our time looking around, as though to absorb all the views at once would’ve been too much. At Bloodhound Buttress we peered over the edge and down into Coire an Dubh-lochain. Even on such a bright day, the lochan lived up to its name: peering back at us, a black eye in the corrie’s socket. It was a privilege to walk in that high land with my daughter. We met no-one else on the mountain, apart from four men who were wearing similar blue t-shirts and khaki shorts. ‘The blue boys’ we called them. Their pace was relentless. They didn’t stop to enjoy the summit but pushed on, explaining that they had more Munros to claim. As we looped around the plateau and began to make our way back down, we could see them far ahead of us: their bright blue t-shirts; two of them bald, their heads hatless, gleaming under the sun. At our camp that night, beneath a cluster of Scots pines, we sat by the fire and ate stew and then biscuits with hot chocolate. The hearth was an old one, well-used, held within a circle of river stones. We spoke quietly beneath the trees – as you would in a church, even if you didn’t subscribe to its faith. Our conversation turned over the events of the day and then widened. My daughter is smarter than I was at fifteen, and more engaged with the world. We talked about Brexit, the consequences for the UK and for Scotland, the range of possible outcomes, including a second Independence Referendum. I reminded her of what she’d said to me after the first one. In 2014, I took both my daughters to Glasgow on the night of the Referendum, to a gathering of friends. When we arrived at Central Station, we detoured to George Square. It was like stepping into footage I’d seen from the eighties, of the Velvet Revolution in what was Czechoslovakia. The excitement was contagious. It felt right that there were Catalan Flags amongst the Saltires: our internationalism not forgotten amidst the clamour for sovereignty. My daughters only remember fragments from that night: a dog with a ‘yes’ sticker on its head; the cars with flags driving round and round the square; the banners. At my friend’s flat, I tucked them into bed in the spare room before the results started coming in. My eldest says it was like falling asleep on Christmas Eve, but waking to find that Christmas wasn’t happening that year. In the morning, my youngest, still in bed, with her sister half asleep next to her, quietly absorbed the news. “Don’t worry dad,” she said, “your generation struck the spark, mine will light the fire.” It still catches me: the innocence and solemnity of her voice; the awareness, knowing that she was saying it partly for my sake, to salve my disappointment. Four years later, in Glen Quoich, my daughter was asleep in her bivvy bag on the other side of the fire. I lay and watched the embers burn down, enjoying the cool of the night after the heat of the day. There were stars and no midges. I knew that I would sleep lightly, on guard, despite trusting there was nothing in the glen to harm us. In that moment, the responsibility of parenthood felt like a blessing. Parents want only to protect their children – this is as true in Glen Quoich as it is in Aleppo. Sometimes I can hardly bear to read the news. Sometimes Scotland’s journey to self-determination seems trivial compared to what’s happening in Syria, or in Yemen. I tried to imagine my empathy as a thing that could spiral out of me, and be sent to others who watched over sleeping children. It was easier to do in the last of a fire’s light, in the quiet of a glen, beneath trees and stars. In the morning, when we forded the river, there was an adder submerged in the shallows, cooling itself, only its head breaking the surface. We gave it a wide berth as we crossed. Its head swivelled as it watched us. After an hour’s walking under the sun, we stopped to swim in a pool. The water was a cold shock, with snow-melt still running off the mountain. It was absolutely translucent. We called it Paradise Pool. The Cairngorms are unique in Britain: an extensive area of semi-tundra upland, home to many rare plants and animals. The glens that surround them have an equally rich natural and cultural history. Established as a National Park since 2003, much of the area is now owned and managed with conservation and restoration in mind; but there remain large parts that are, in the words of Green MSP Andy Wightman, “devastated, blasted, deforested, burnt and over-grazed”. Mountain hares are culled in those parts, on an industrial scale, for the benefit of those who like to shoot guns at birds. A word like ‘ownership’ is tricky when it comes to landscape. The usual, phlegmatic rules of capitalism are inadequate. It might be a simple truth that someone can purchase, and thus own, a watch or a toaster, but a mountain? At what depth of legitimacy does that apply? Can someone really own the pool in the river that my daughter and I swam in? Near the foot of the glen, we looked back up to Beinn a’ Bhuird. The Laird’s Tablecloth gleamed white under the blue sky. So far, in this hot century, it has disappeared before the end of every summer, but the Farquharsons still own Invercauld. When pressed on the lack of snow, the current Laird will admit only that “the tablecloth might be dirty, and in need of a wash to bring out its whiteness!” It’s a good response, given with a twinkle in the eye; but accelerating climate change means there might soon be years when there’s no snow at all in Ear-choire Sneachdach, even in winter; and perhaps, with the ongoing clamour for land reform in Scotland, the melting of the Laird’s Tablecloth will finally herald the end of a system of ownership at odds with more enlightened ideas of community empowerment and land stewardship. Beautiful piece and a pleasure to read. Goosebumps of recognition, joy, sadness, hope, full presence. A stunning piece. Thank you. What a lovely story and I especially like the Christmas Eve analogy. Your commentary flows like the river flows through Glen Quoich clear sparkling & refreshing . Thank you .